We can make the mistake when managing others of over functioning – doing more than is necessary or appropriate to compensate for another person’s shortcomings. Giving up control and letting go can be incredibly difficult, especially if you’ve been given responsibility for an outcome. But the route to an individual’s growth is a delicate dance between receiving guidance and intervention and needing room for experimentation and a different approach. The counterweight to over functioning is to recognise when to back off and allow another person their experience. As you know, experimentation, near misses and failure have value. Not getting it right is one of the ways we learn and grow, so if there is no space for this in your management style, you’ll be breeding dependency and under functioning in others. The under functioning comes from a team member not suffering consequences for their deficiencies, given they know that you, as their manager, will compensate, right the wrong and smooth things over. To not interfere, even when you can see there is a better way, will be foreign to you when you’re used to calling the shots. As a leader, you make the judgement call about when to let go by assessing consequences. If this person fails at the task, what will be the result? It’s a sliding scale, and obviously the bigger the consequence in terms of money lost or customer or brand disaffection, the less room for mistakes. But there are ways we can get there. 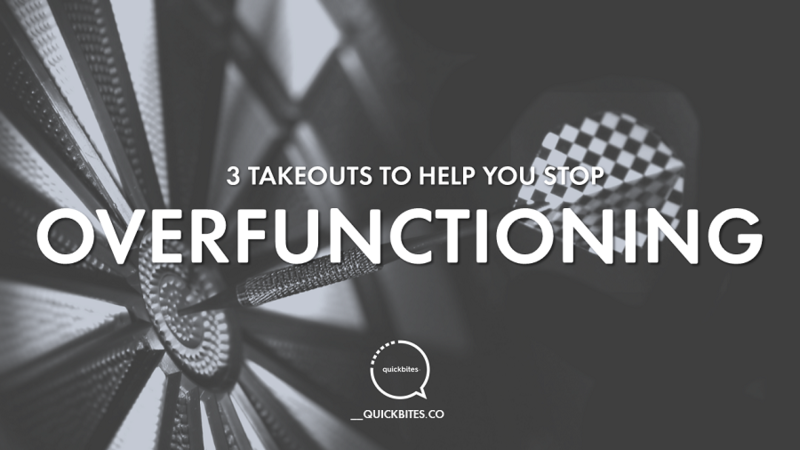 Here are 3 takeouts to assist. An apprenticeship, such as an interim assignment, a project with finite parameters and responsibility, or a pilot scheme, are all safe places to learn and grow given risk and consequences can be minimised. All of us should learn to honour the apprenticeship, as we’re never too old or too senior to reap its benefits. As a manager, ask yourself “what will happen if I let this experience play out and have it come to its natural conclusion?” Very often, the lesson is in the journey, and to cut that lesson off for a person by intervening in the rhythm of things, can stop the flow of a probable consequence. Stephen Covey had the insight that maturity is reached by travelling first through dependency, then independency and finally interdependency. Interdependency is the higher functioning state for all and is the basis for superior teams. Interdependency means people can express their vulnerabilities and rely on each other, whilst taking accountability and responsibility for their own tasks and outcomes.